Pumpkin waffles are easy to make and delicious topped with homemade buttermilk syrup! The perfect breakfast for any fall morning! One of my all-time favorite, go-to recipes for fall is Pumpkin Waffles. This recipe originated with my sister’s mother-in-law, and we are all OBSESSED with it now. It is perfect for a Fall brunch or for “breakfast for dinner,” as my mother always called it. 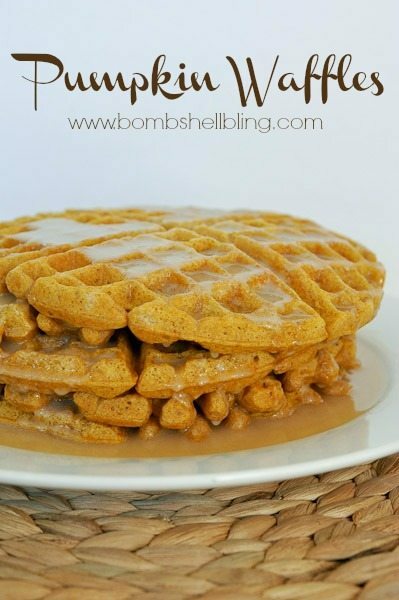 I am so excited to share this pumpkin waffles recipe with you today! We make it several times through the season, and we always, ALWAYS make our Buttermilk Syrup to accompany it. It is TO. DIE. FOR. The buttermilk syrup takes the pumpkin waffles to a whole new level of divinity. Not that I’m dramatic about food or anything. Heehee. Here’s the recipe for perfect pumpkin waffles. ENJOY! Mix dry ingredient and set aside.well. Beat egg yolks with a mixer, save the whites. Add milk, pumpkin, butter, and vanilla to the beaten egg yolks and mix well. Top with syrup, preferably homemade buttermilk syrup. I love anything pumpkin and waffles are always yummy! TFS!!! Oh Sarah, these look fantastic! I will definitely have to make these for my boys. Pinning to try soon! These look awesome Sarah! Can’t wait to try! Just wondering if the amount of baking powder is correct – seems like a lot! Yep, it’s correct! It does seem like a lot, but it’s correct! Well, I made them. They were beautiful, they smelled amazing, and the first bite was glorious…then GAG! Epic fail…I had put in baking SODA instead of powder! Can’t wait to make them again, using the right ingredient! OH NO!!!!!!! Be sure to try again! I made these today with the buttermilk syrup. They are wonderful!! Thanks for sharing. When I see waffle recipes I always wish I had a waffle maker! Maybe I should just invest in one 🙂 thanks for linking up at the Weekend Wind-Down Party!